The 100% Australian made water efficient Top-Tee Sprinkler is the replacement sprinkler head for the Wobble-Tee Sprinkler. It is designed to operate at various water pressures covering a large area up to 15 meters in diameter. There is no misting on low to medium water pressure which minimises wind drift and evaporation loss. This combined with a consistent droplet size and slow application rate allows all the applied water adequate time to soak into the soil, like slow soaking rain. The Top-Tee sprinkler has a 20mm male thread - 3/4 BSP. It can be mounted on a solid riser for nursery, garden or orchard irrigation. 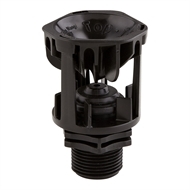 The Top-Tee sprinklers have only one moving part operating on water lubricated urethane surfaces which extends the longevity of the sprinkler life.